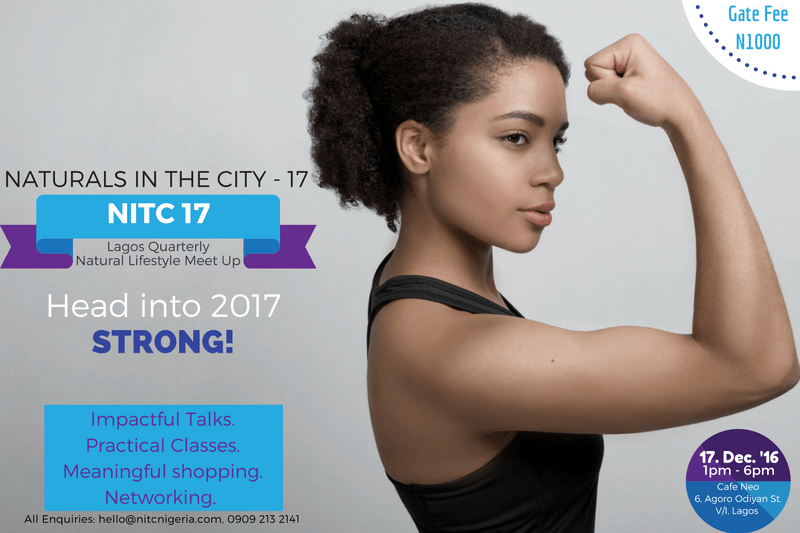 Home 2016 December 12 Head Into 2017 Strong, With Naturals in the City 17! Naturals in the City, Lagos’ quarterly natural hair meet-up is rolling back around this December! I had so much fun at Naturals in the City 16 in September, it really was my favourite one yet. Naturals in the City 17 is on December 17, the last weekend before Christmas, so let’s top the last experience, shall we? I look forward to hanging with you at our usual joint, Cafe Neo on 6, Agoro Odiyan Street, Victoria Island. As usual, we will be having impactful talks and practical workshops. The theme for the meet-up is “Head into 2017 Strong!”, because you are so important to us, we want you starting on the right foot in the new year. Prepare to treat yourself, and the ones you love, by shopping from the great brands in our marketplace. See photos from the last meet-up in this post HERE and more on the official website: nitcnigeria.com.